The His & Hers Michigan Winter Pullovers are finished ! Interesting improvisations I’ve done, with ‘His’ v-neck. I was pulling my hair out trying to figure out how to do it, never having done it before. But now I think it looks very unique ~ steeked on the body, then after shirt-yoke was finished up to the steek in front, I transfered the live stitches on to waste yarn while I continued the yoke across back to be grafted together. Finally I cut the steek, and then picked up the steek stitches , back edge, and live stitches all around for a K2/P2 rib. ‘Hers’ crew style neck was a cake walk ! I really love the tweedy look for these, sparkling with flecks of buff, browns, black, ivory, and occasional bright-colored Donegal nebs. I wonder do they do look a little long in the arms? Yeah, I guess, partly because they are sagging a bit off of the hangers (I know, not the ideal way to display a handknit garment such as these) however, I assure you these sweaters were custom measured, and I stayed true to the wearers’ measurements, but I believe I added an inch (or two) to the sleeves to ensure they weren’t too short, and the end result is, well, much longer sleeves. But we’ll see when they are slipped on Him & Her. Here is the back ! the seamless shirt-yoke . . .
A close-up detail of how the decreases go into the yoke. . .
Another (rather fuzzy) close-up of moi’s wild improvisational work. . .
And I just love, love, love the two-stitch cord bind-off on the rib. . . I like to sew on the label just above the rib, in the back . . .
Now these his & hers pullovers get shipped to Michigan, to keep warm two very dear young homesteaders, Rosanna & Felix , in their first year of settling & farming, undoubtedly shivering in their yurt, in the soon-to-be snowy winter landscape. Not without a herd of goats, flock of chickens, geese, and a manic farm dog to chase after ! Yarn : Knit Picks Wool Of the Andes Tweed ( 80% Peruvian Highand wool, 20% Donegal Tweed) . Worsted weight. 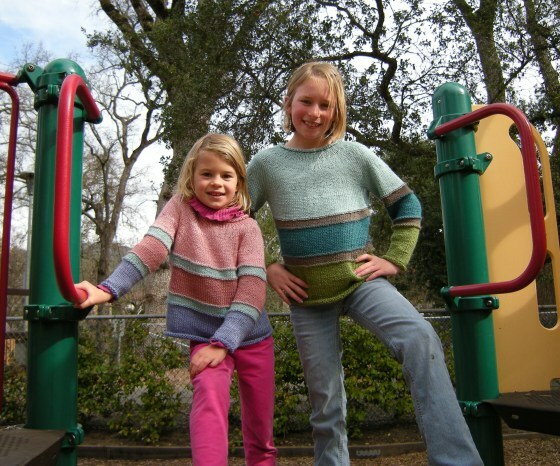 Pattern : Elizabeth Zimmerman’s Seamless Shirt Yoke sweater, in “Knitting Without Tears” ~ somewhat modified throughout. Here is Michigan Winter ‘Hers’ in the home stretch, about to be washed & blocked. Just look at that lovely switching of direction of the grain in the knitted fabric ! All knitted in, seamlessly, and very tidy. Isnt’ it just so exquisitely clever ? Just wonderful is the Elizabeth Zimmermann Shirt Yoke seamless sweater design ! I have done things a bit differently overall, but stayed true through the shirted yoke section at least, because that is the element of design I’ve wanted to learn. And learn I did. And I love, love, love the EZ Seamless Shirt Yoke !!!! Am finishing off the neck with something different for me, as edge for a K2/P2 rib, I’m trying a 2-stitch i-cord bind-off ! 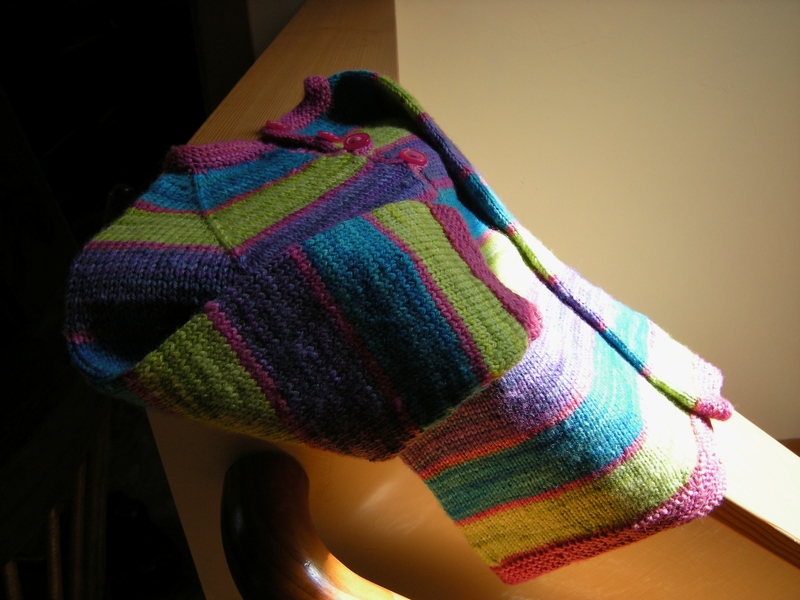 Yes, the highly esteemed and beloved Elizabeth Zimmermann ~ Mother of Modern Knitting ~ is responsible for this knit-trick of the “i-cord” , and brought it into the limelight with so many of her designs, as applied, cast-on, bind-off, and anything in between. I don’t know why people just don’t refer to it as the ‘ EZ cord’ , or even the E-cord (for Elizabeth). I think I shall for fun. (call it the e-cord). I’m going to just ‘toss one on’ each of these neck finishes as a bit of an afterthought, because quite frankly… Everybody’s Doing It ! Edit in : Both His & Hers sweaters are all done, washed, blocked. 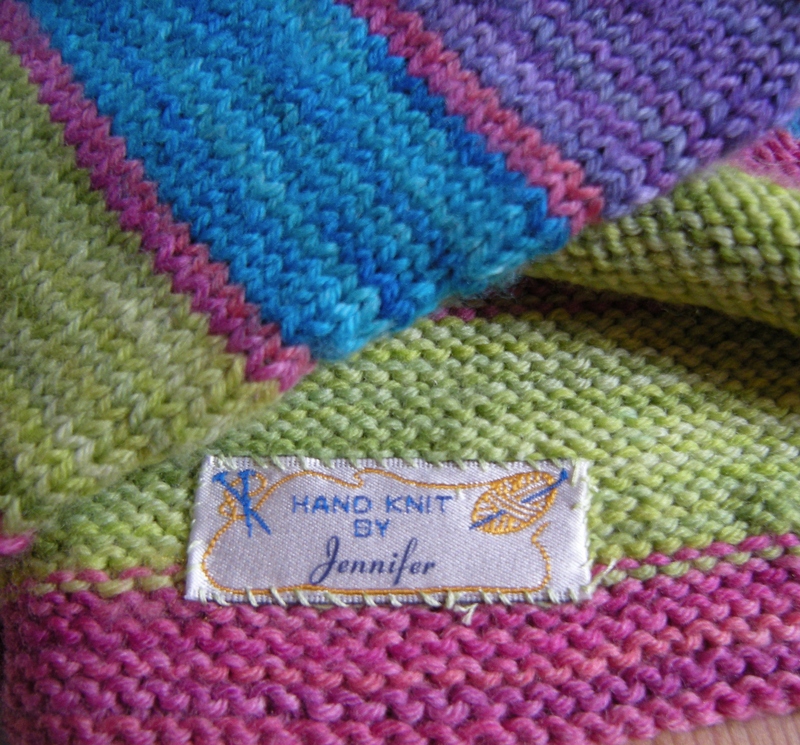 Need to just sew on the “hand-knit by Jennifer” labels, photograph & post final pictures of them…. 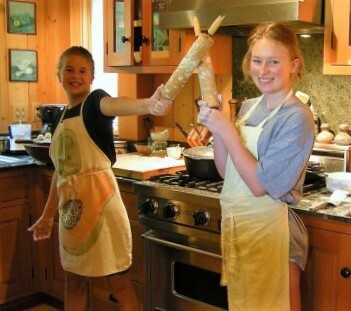 then send them off to Mr & Mrs Homesteaders in Michigan. Yay… done & dusted ! I am off for a celebratory walk in the cold post-rainy mossy green woods, and I’ll be bringing my knitting of course. C’mon Emma, lets go stir up them giant salamanders ! I am knitting, ripping, and knitting over (and over) the section of Elizabeth Zimmerman’s Hybrid Shirt-Yoke Seamless Sweater variation. The problem is not following the delightfully written instructions for it, in “Knitting Without Tears” (and which I talk about briefly in this post ) , but in my usual improvisation of the design , as one of the homesteaders asked for his to have a v-neck. 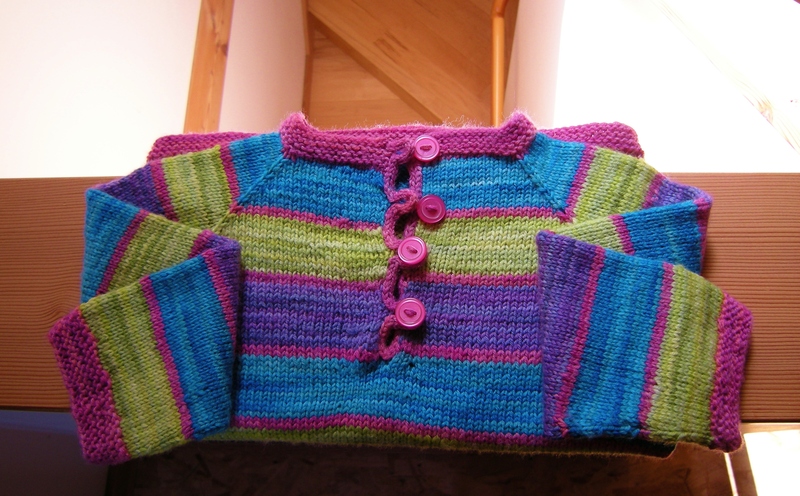 The sweater design of the hybrid shirt yoke sweater of Elizabeth Zimmerman’s actually has a particular neck opening which results from the particular shirt yoke style, and it is not v-shaped in the least. So I have to figure out how to do it. Wingin’ it again. Never not improvising, which is exhilarating, but stressful . Rip, rip , rip, knit again. Repeat. Two steps forward, and one step back. So I continue to knit & rip, and knit again…because I do know that only by doing this can I get ahead of the learning curve. Only by doing this an insane amount of times, can I truly understand how this all works…. even though at times I feel like a brainless knitting machine. Oh hey !!! “Knit Again” brings something to mind I want to share. It occurred to me in my predicament to ~ finally ~ watch the foreign film that is all about this insane act of knitting and ripping, and knitting again. “Wool 100% ” by Mai Tominaga. This film grasps it truly ! A very abstract film, and a bit nightmarish in imagery, but clean enough. I highly recommend it for all foreign film loving knitters . Looking ahead a little bit. I am looking ahead to some fast knitting-by-the-fire during the first rains of October this Autumn, ‘whipping out’ so to speak , a couple of these seamless Elizabeth Zimmerman designs in time for the big holiday, for two homesteaders dear to my heart, just starting out and in their first winter in Michigan. As I am exploring All Things E.Zimmerman these days, I’m considering a new style I haven’t yet tried. I’m looking at this design . . . I find seamless to be the most ‘ seemly ‘ in appearance, and well, I can’t afford to fuss about with anything else when I need speed and volume to be in my favor. My itinerary is to finish up nieces sweaters this month, then start right in on two of these in ‘ Hers & His ‘ style. Elizabth Z. ~ I’m counting on you . I would love to discuss the established Percentage Systems of Seamless Yoke Construction. Anybody game? Here’s the deal, the sweater heaped on the chair, getting ripped back was because I mistakenly went along my merry way starting the decrease rows from the method I’m use to , a ‘percentage system’ of a kind that I came up from the charts I’ve used, completely forgetting how this time I wanted to try out strictly Elizabeth Zimmerman’s Percentage system. (no hybrid!) Feeling a little bit unsure with the over-all fit of another way, I am trying to anticipate the difference. I’m laying the math out and taking a close look. Elizabeth’s Percentage System, or cute little title of “EPS” as it is known among the Zimmermaniacs of the Modern Knitting World, I will extract from her book which I bought recently (used) called “Knitting Around”. In EPS, the depth of the yoke is to be approximately half of the width of the main body before the sleeves are joined on (not circumferance, but laid flat, measured-across-width-wise measurement~ and then half of that is the “yoke depth”). After joining the sleeves to the body, all on one circular needle, EPS has you knit up half of the entire yoke depth before beginning the first decrease row, and continueing with only 3 decrease rows total, dividing the upper half into halves, (quarters of the total depth, actually) with the third and last decrease at the neckline. EPS is roughly as follows: On the first decrease row , the total stitches are decreased by 25% , with *K2,K2tog* repeat. One knits up to I suppose about another quarter section of the whole yoke depth (perhaps after a decorative pattern allows), then begins the second decrease row, where the new total stitches is decreased 33.3% , with a *K1,K2tog* repeat. The last and third decrease, right before the short-row shaping at the back of the neck, is a decrease row which is a *K1,K2,K2tog* repeat which decreases the new total of stitches 40% and which then leaves the remaining total of stitches to be finished off method of choice. The last remaining stitches also is around 40% of the original casted-on total of stitches. That is roughly, a condensed summery I think, of Elizabeth Zimmerman’s Yoke decreasing which I am about to try for the first time. Now, the other yoke-decrease method , percentage system if you like, that I’ve been using up until now, is what I’ve come up with by following the instructions of the charts of the book of Ann Budd’s called “Handy Book of Sweater Patterns”, a great book loaded with charts so one can design just about any kind of sweater from any yarn and needle combination (within reason of course). This book has been my ‘bible’ up to now, along my adventure thus far of seamless yoke sweaters. It goes something like this : The total yoke depth is likely the same as EPS, but one begins the first decrease row after only about 1/4 , or less, of the total yoke depth (instead of half). If you factor in the fourth decrease row at the neck, you’ve got the whole yoke depth divided into thirds, with the last and fourth decrease being at the neck. So far , are you with me ? That’s one extra decrease row than EPS, but different ratios of decrease. The way I’ve managed to figure the math from the charts , and from my own ‘imaginary sweater’ which employs the EPS as a template ~ has had the first row decrease of 20% total stitches, with a *K3,K2tog* . The second decrease row , about half way up the yoke, decreases the new total of stitches 25% with a *K2,K2tog* repeat. The third decrease row about 3/4 or thereabouts up the yoke depth, (depending entirely which pattern one might design into the yoke) decreases the new total of stitches 33.3% with a *K1,K2tog* repeat. 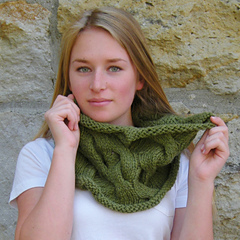 The last decrease row, just before the short-row shaping at the back of the neck opening, repeats the *K1,K2tog* pattern to arrive at the final neck finish total of stitches. Are you still with me? Have I made any outrageous math mistakes yet? (If so, please point them out). So what I’d like to know, is if there are any of you reading, who has tried different yoke shapings, and can enlighten me to how the end result actually fits being worn. Until then, I will finish off my nieces Autumn Sweaters using completely Elizabeth Percentage System, and see for myself. I will no doubt, be anxious to spill the beans when the finished sweaters are all blocked out. I have a sweater which I haven’t finished (haven’t steeked yet) which is shaped through the decreases from the Ann Budd charts to compare the EPS yoke shape to. Sit tight, and see me get giddy with my newly discovered math abilities (Yes, I’m suggesting that I always was a very bad math student). I’ve quite astonished myself actually ! See you back on the subject in a few posts. … and deliberating over this & that…. At long last this little sweater can go to it’s wee little child. In fact, her birthday is just three days before Easter this year, and it *does* happen to look very much like a painted Easter egg ! For the moment I am immersed in knitting-while-watching this instructional dvd I borrowed from the local library. I am blissfully captivated for hours and hours, learning all about everything Zimmermann Knitting, even the things I thought I already knew, I am learning again, and better. Taking a break, while about two thirds the way through the series ~ while working untiringly on Eleanor’s birthday sweater, which is rather ending up quite another improvisation, I must admit. I can’t get enough of Elizabeth Zimmermann’s lessons on seamless yoke sweaters, and her Percentage System, her very creative ways of hemming ( and with messages in the hem, now that is clever ! )… just about every kind of decrease and increase, and just all those Zimmermann-esque finer touches. Right now, I’m on the lesson about how to do applied i-cord. I had only suspected before, but now I know for sure that it was Elizabeth Zimmermann who developed the ‘ i-cord’ in knitting. The name she called this cord was just her more polite rewording the name idiot cord ( how unbelievably sweet of her. ) I think the i-cord was her way of achieving the same product that was made from ‘spool knitting’, and she pretty much figured out how to do on knitting needles, casting on with it, binding off with it, and applying it from picked-up stitches just about anywhere in between. Brilliant. Oh , but she, the Mother Of Modern Knitting also brought the i-cord into center stage, and demonstrated just about every concievable way to use it on a piece of knitting or lace border, or for just about everything. For me the genius of Elizabeth Zimmermann’s i-cord is only just being realized, as I watch her “Knitting Workshop” , oh, she is showing her i-cord applied as edging for , or instead of ~ button bands , and she has created dear little buttonholes too, both invisibly as detached in intervals along the applied border, and also decoratively as loops ! All this she demonstrates and talks so with a manner of teasing, as if I would want nothing more than to take that piece of knitterly candy right out of her outstretched palm. Genius ! If the Mother Of Modern Knitting wants me to use it , I shall. Watching this dvd just today is just perfect timing, it’s uncanny, because I’ve been deliberating on how to do the button bands of Nora’s pullover, which has a neck button band, which is tricky and I’ve never done one. I do believe EZ’s instruction on how to apply the i-cord as an ‘invisible’ buttonhole band is going to be the answer to my puzzle. It was meant to be ! I am smitten. Anyway, I have SO many ideas coming to mind, and I love most how she encourages thoroughly, total experimentation, and figuring out as you go. And well, it’s no big deal because as she always says ~” it’s only knitting “. How wonderful she is. I just love her ! Edit In : Just finished the dvd. I am refreshed with a tenacious desire to knit some textured Fisherman ganseys as well as more traditional Scottish Fair Isle things. And, well, I have just learned a NEW thing that I’ve never seen before. EZ’s sideways border and sideways join on front and back of sweaters, looking very much like a saddle shoulder on textured knitted sweater, but it’s especially brilliant because it is more like a yoke and allows the neck shaping to be easily done. I always wondered how these things were handled. Now I know. I will likely go wild with the SIDEWAYS BORDER and JOIN … so much that I am afraid I will become Sideways ! I will have to watch this over again and again, I think that she just has a way of rubbing off a certain amount of No Sweat, its-only-knitting sort of attitude which I just adore. Hey ! 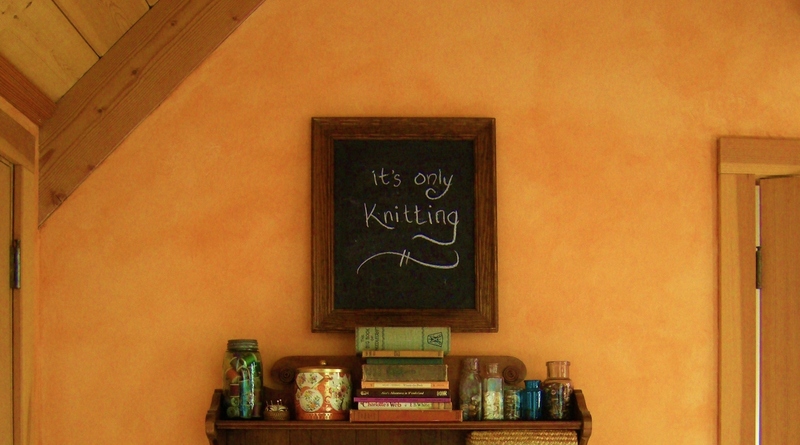 It’s only knitting !